The charm of our LuxCraft Garden Wishing Well with Cedar Roof-Medium will draw the eye and warm the heart! This Amish wishing well will brighten your garden, deck or entryway and provide a lovely centerpiece for your outdoor scene. Use an Amish wishing well to decorate your garden or yard. This attractive LuxCraft well provides an enchanting background decoration for family photos and videos. Little ones will love visiting the well and lowering and raising the bucket. Keep this LuxCraft Garden Wishing Well with Cedar Roof in mind for the perfect housewarming or wedding gift. For a smaller space or yard, we have a mini version available with our Amish Garden Wishing Well with Cedar Roof-Small. 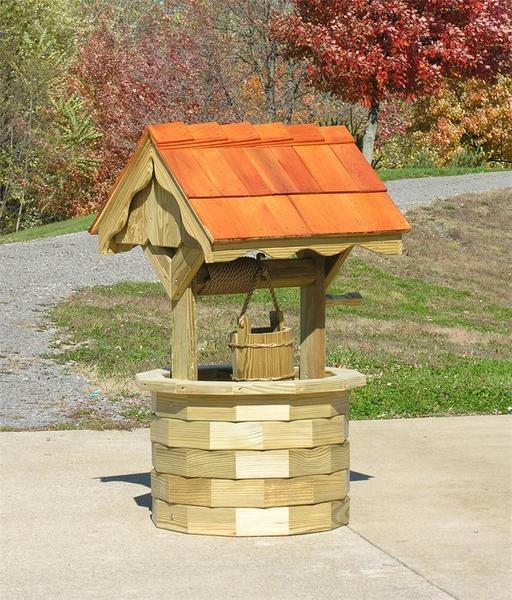 Handcrafted in Ohio by skilled Amish craftsmen, this Amish wishing well is made of pressure treated kiln dried yellow pine. Have you heard about the benefits of pine? Like other elements of Amish made furniture, pine is durable and attractive! Be sure to review our wide selection of Amish Outdoor Garden Decor products. Call one of our Amish Furniture Specialists today at 1-866-272-6773 with any questions.